Nahum's brother Merrick Wallace was a fellow settler. Hannah's ancestry can be seen on her father Thomas Bennett's page. 1. NAHUM3 WALLACE (NAHUM2, JAMES1 WALLIS) was born Abt. 1810 in Killingly CT, and died 17 Apr 1903 in Gardner MA. He married (1) HANNAH MITCHEL BENNETT in by 1835, daughter of THOMAS BENNETT and MARY PRATT. She was born Abt. 26 Jun 1808 in Gardner MA, and died 28 Aug 1863 in Gardner MA. He married (2) ANGELINE YOUNG 12 Nov 1870 in Gardner MA, daughter of REUBEN YOUNG and MEHITABLE ?. She was born Abt. 1821 in NY, and died Aft. 1880. 2. i. ANN MARIAN4 WALLACE, b. 07 Aug 1835, Gardner MA; d. 17 Dec 1895, Gardner MA. 3. ii. JOHN WILLIAM WALLACE, b. 19 Mar 1837, Gardner MA; d. 23 Sep 1905, Templeton MA. iii. MARY E WALLACE, b. 03 Dec 1838, Gardner MA; d. Aft. 1900; m. DANIEL RUSSELL, 08 Sep 1884, Templeton MA; b. Feb 1822, New Salem MA; d. 08 Nov 1901, Templeton MA. iv. ADELAIDE AZUBAH WALLACE, b. 21 May 1841, Gardner MA; d. 16 Mar 1842, Gardner MA. 4. v. ADELAIDE A WALLACE, b. Abt. 1843, MA; d. 07 Oct 1882, Winchendon MA. 5. vi. ALBERT AUGUSTINE WALLACE, b. 10 Sep 1846, Gardner MA; d. Aft. 1920. 6. vii. MARTHA S WALLACE, b. 01 Apr 1848, Gardner MA; d. Bet. 1880 - 1900. 2. ANN MARIAN4 WALLACE (NAHUM3, NAHUM2, JAMES1 WALLIS) was born 07 Aug 1835 in Gardner MA, and died 17 Dec 1895 in Gardner MA. She married ASAPH BLAKELY WHITNEY 08 Jun 1853 in Templeton MA, son of JOSEPH WHITNEY and NANCY SAWIN. He was born 21 Aug 1817 in Gardner MA, and died 01 Mar 1892 in Gardner MA. i. VERNOR FREMONT5 WHITNEY, b. 06 Jul 1856, Gardner MA; d. 23 Aug 1856, Gardner MA. ii. HATTIE E WHITNEY, b. Abt. 1864, MA - adopted? ; d. Bet. 1888 - 1901; m. WILLIAM W THOMSON, 25 Jun 1888, Athol MA; b. 07 May 1859, Prince Edward Island/Nova Scotia; d. Bet. 1920 - 1930. 3. JOHN WILLIAM4 WALLACE (NAHUM3, NAHUM2, JAMES1 WALLIS) was born 19 Mar 1837 in Gardner MA, and died 23 Sep 1905 in Templeton MA. He married (1) MARY R SIMONDS 17 Jul 1861 in Templeton MA, daughter of WARREN SIMONDS and MARY ?. She was born Abt. 1839 in Templeton MA, and died 08 Jul 1867 in Templeton MA. He married (2) ALMIRA AUGUSTA DIVOLL 27 Apr 1869 in Templeton/Winchendon MA, daughter of LEVI DIVOLL and LUCY STONE. She was born 22 Oct 1830 in Winchendon MA, and died 14 May 1915 in Winchendon MA. i. WILLIAM WARREN5 WALLACE, b. 23 Jun 1864, Templeton MA; d. 10 Nov 1866, Templeton MA. 7. ii. MARIE H WALLACE, b. Jul 1865, MA; d. Aft. 1930.
iii. EARNEST A WALLACE, b. Abt. 1867, Templeton MA; d. 18 Mar 1867, Templeton MA. 4. ADELAIDE A4 WALLACE (NAHUM3, NAHUM2, JAMES1 WALLIS) was born Abt. 1843 in MA, and died 07 Oct 1882 in Winchendon MA. She married WILLIAM SMITH, son of GEORGE SMITH and ANN HUTCHINS. He was born Apr 1833 in England, and died 31 Aug 1903 in Winchendon MA. 8. i. EDWIN W5 SMITH, b. 05 Mar 1866, Winchendon MA; d. 21 Oct 1951, OH. ii. WALTER H SMITH, b. Abt. 1868, MA; d. Aft. 1880.
iii. ANNA M SMITH, b. Aug 1872, MA; d. Aft. 1940. 9. iv. ALVAH MONTON SMITH, b. 12 Jul 1875, Winchendon MA; d. Bet. 1930 - 1940. 5. ALBERT AUGUSTINE4 WALLACE (NAHUM3, NAHUM2, JAMES1 WALLIS) was born 10 Sep 1846 in Gardner MA, and died Aft. 1920. He married JULIA E GALE 27 Apr 1871 in Winchendon MA. She was born Aug 1847 in MA, and died Bet. 1900 - 1920. 10. i. ARTHUR A5 WALLACE, b. Abt. 1877, Troy NH; d. 03 Nov 1942, Keene NH. ii. ELLEN G WALLACE, b. Jun 1886, NH; d. Aft. 1920. 6. 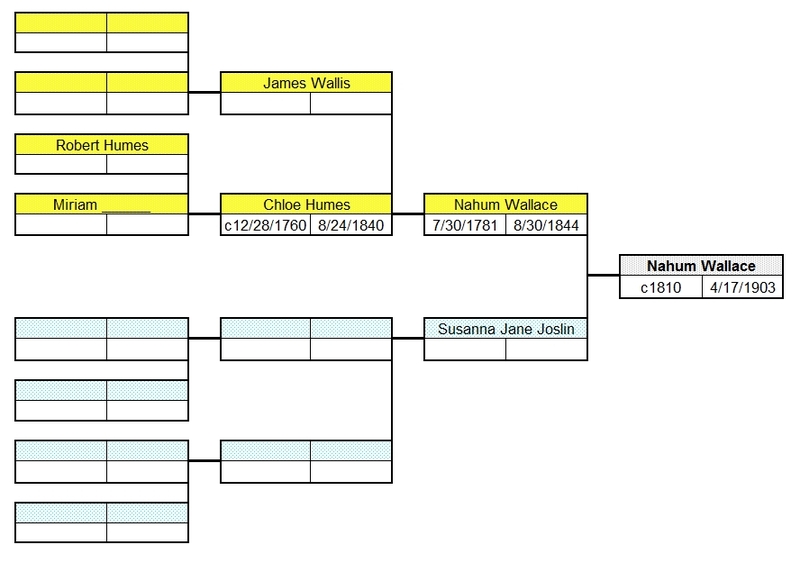 MARTHA S4 WALLACE (NAHUM3, NAHUM2, JAMES1 WALLIS) was born 01 Apr 1848 in Gardner MA, and died Bet. 1880 - 1900. She married CHARLES E THOMPSON 25 Oct 1871 in Fitchburg/Templeton MA, son of EZRA THOMPSON and MAHALA ?. He was born 18 Apr 1838 in Greenwich MA, and died Aft. 1900.
i. FRANK WILLARD5 THOMPSON, b. 27 Nov 1872, Templeton MA; d. 02 Aug 1873, Templeton MA. 7. MARIE H5 WALLACE (JOHN WILLIAM4, NAHUM3, NAHUM2, JAMES1 WALLIS) was born Jul 1865 in MA, and died Aft. 1930. She married ARTHUR LEE HAWKES 15 Dec 1885 in Templeton MA, son of GEORGE HAWKES and ELIZABETH SPARHAWK. He was born 09 Nov 1864 in Templeton MA, and died Aft. 1930. 11. i. RALPH LEE6 HAWKES, b. 09 Feb 1886, Templeton MA; d. Aft. 1940.
ii. WILLIAM SPARHAWK HAWKES, b. 23 Feb 1889, Templeton MA; d. Aft. 1942; m. HELEN B ? ; b. Abt. 1892, MA; d. Aft. 1940. 12. iii. HERBERT EDWIN HAWKES, b. 19 Jan 1892, Templeton MA; d. Jul 1982, Worcester MA. iv. GEORGE MARCUS HAWKES, b. 06 Jul 1894, Templeton MA; d. Aft. 1920. 13. v. RUTH ELIZABETH HAWKES, b. 29 May 1896, Templeton MA; d. Aft. 1940. 14. vi. HELEN HAWKES, b. 29 Aug 1897, Templeton MA; d. Aft. 1940.
vii. WARREN SIMONDS HAWKES, b. 03 Jun 1899, Templeton MA; d. 19 Feb 1901, Templeton MA. viii. ARTHUR LEE HAWKES, b. Abt. 1901; d. 06 May 1902, Templeton MA. ix. RICHARD W HAWKES, b. Abt. 1904, MA; d. Aft. 1920.
x. SON HAWKES, b. 10 Sep 1904, Templeton MA; d. 13 Sep 1904, Templeton MA. 8. EDWIN W5 SMITH (ADELAIDE A4 WALLACE, NAHUM3, NAHUM2, JAMES1 WALLIS) was born 05 Mar 1866 in Winchendon MA, and died 21 Oct 1951 in OH. He married LETTA SUSAN BROWN 21 Aug 1887 in Winchendon MA. She was born Apr 1867 in Nova Scotia, and died Aft. 1930.
i. PERCY EVERETT6 SMITH, b. 01 Jul 1888, Winchendon MA; d. Aft. 1910. 15. ii. MELBERN PARKER SMITH, b. 22 Nov 1890, Winchendon MA; d. 11 Feb 1974, Greenfield MA. 16. iii. HENRY HOUGHTON SMITH, b. 10 Apr 1894, Winchendon MA; d. Aft. 1940.
iv. OSCAR EDWARD SMITH, b. 02 Sep 1897, Winchendon MA; d. Aft. 1910. 17. v. BLAKNEY BROWN SMITH, b. 07 Mar 1899, Winchendon MA; d. 09 May 1937, Akron OH. 18. vi. BERNARD CLARK SMITH, b. 15 Jul 1901, Winchendon MA; d. Aft. 1940.
vii. GOLDIE E SMITH, b. Abt. 1906, NH/Canada; d. Aft. 1940; m. JOSEPH ROBICHARD; b. Abt. 1905, MA; d. Aft. 1940.
viii. EDWIN H WILLIAMS, b. Abt. 1925, OH - grandson - child of Goldie? ; d. Aft. 1940. 9. ALVAH MONTON5 SMITH (ADELAIDE A4 WALLACE, NAHUM3, NAHUM2, JAMES1 WALLIS) was born 12 Jul 1875 in Winchendon MA, and died Bet. 1930 - 1940. He married MILLIE A STINE 03 Sep 1902 in Winchendon MA. She was born Abt. 1883 in MA, and died Aft. 1940.
i. MARSHALL W6 SMITH, b. Abt. 1910, MA; d. Aft. 1940. 10. ARTHUR A5 WALLACE (ALBERT AUGUSTINE4, NAHUM3, NAHUM2, JAMES1 WALLIS) was born Abt. 1877 in Troy NH, and died 03 Nov 1942 in Keene NH. He married EVA S GOULD 30 Oct 1897 in Marlborough NH. She was born Jan 1871 in Troy NH, and died Aft. 1940.
i. MILDRED A6 WALLACE, b. Sep 1899, NH; d. Aft. 1940.
ii. HERBERT L WALLACE, b. 08 Mar 1900, Marlborough NH; d. 04 Jun 1900, Marlborough NH. iii. CHILD WALLACE, b. 07 May 1904, Grafton MA. iv. GERALDINE J WALLACE, b. Abt. 1906, NH; d. Aft. 1940.
v. RUSSELL GOULD WALLACE, b. Abt. 1907, NH; d. Aft. 1935; m. HELEN MARGARET WOODWARD, 24 Aug 1935, Keene NH. 11. RALPH LEE6 HAWKES (MARIE H5 WALLACE, JOHN WILLIAM4, NAHUM3, NAHUM2, JAMES1 WALLIS) was born 09 Feb 1886 in Templeton MA, and died Aft. 1940. He married PEARL LUELLA HAMILTON 21 Nov 1912 in Templeton MA, daughter of JOHN HAMILTON and LUELLA WHITNEY. She was born 09 Oct 1892 in ND/Baldwinville MA, and died 09 Jul 1981 in Templeton MA. i. ARTHUR H7 HAWKES, b. Abt. 1915, MA; d. Aft. 1930.
ii. ROBERT W HAWKES, b. Abt. 1922, MA; d. Aft. 1940.
iii. GEORGE W HAWKES, b. Abt. 1926, MA; d. Aft. 1940.
iv. MARJORIE W HAWKES, b. Abt. 1929, MA; d. Aft. 1940. 12. HERBERT EDWIN6 HAWKES (MARIE H5 WALLACE, JOHN WILLIAM4, NAHUM3, NAHUM2, JAMES1 WALLIS) was born 19 Jan 1892 in Templeton MA, and died Jul 1982 in Worcester MA. He married MILDRED S ?. She was born Abt. 1891 in ME, and died Aft. 1940.
i. MARION R7 HAWKES, b. Abt. 1919, MA; d. Aft. 1940. 13. RUTH ELIZABETH6 HAWKES (MARIE H5 WALLACE, JOHN WILLIAM4, NAHUM3, NAHUM2, JAMES1 WALLIS) was born 29 May 1896 in Templeton MA, and died Aft. 1940. She married ? FOSKETTE in Later divorced. i. HELEN CONSTANCE7 FOSKETTE, b. Abt. 1925, MA; d. Aft. 1940.
ii. BARBARA FOSKETTE, b. Abt. 1926, MA; d. Aft. 1940. 14. HELEN6 HAWKES (MARIE H5 WALLACE, JOHN WILLIAM4, NAHUM3, NAHUM2, JAMES1 WALLIS) was born 29 Aug 1897 in Templeton MA, and died Aft. 1940. She married WILLIAM H SPAULDING. He was born Abt. 1887 in MA, and died Aft. 1940.
i. ELEANOR M7 SPAULDING, b. Abt. 1924, MA; d. Aft. 1940.
ii. CHARLOTTE SPAULDING, b. Abt. 1929, MA; d. Aft. 1940. 15. MELBERN PARKER6 SMITH (EDWIN W5, ADELAIDE A4 WALLACE, NAHUM3, NAHUM2, JAMES1 WALLIS) was born 22 Nov 1890 in Winchendon MA, and died 11 Feb 1974 in Greenfield MA. He married ADELE C THOMAS 26 Nov 1908 in Peterborough NH. She was born Abt. 1891 in Canada, and died Aft. 1940.
i. VIOLA PEARL7 SMITH, b. 26 Jun 1909, Peterborough NH; d. 26 Jun 1909, Peterborough NH. ii. FRANCIS MELBURN SMITH, b. 14 May 1911, Athol MA; d. Aft. 1930.
iii. DONALD THOMAS SMITH, b. 11 Apr 1913, Athol MA; d. Aft. 1940.
iv. LOUISE I SMITH, b. Abt. 1915, MA; d. Aft. 1930.
v. ELIZABETH A SMITH, b. Abt. 1921, MA; d. Aft. 1940. 16. HENRY HOUGHTON6 SMITH (EDWIN W5, ADELAIDE A4 WALLACE, NAHUM3, NAHUM2, JAMES1 WALLIS) was born 10 Apr 1894 in Winchendon MA, and died Aft. 1940. He married MARY E ?. She was born Abt. 1894 in NH, and died Aft. 1940.
i. VIIOLET M7 SMITH, b. Abt. 1912, NH; d. Aft. 1920.
ii. MILDRED C SMITH, b. Abt. 1920, OH; d. Aft. 1930.
iii. JAMES H SMITH, b. Abt. 1923, OH; d. Aft. 1940.
iv. SARAH E SMITH, b. Abt. 1925, OH; d. Aft. 1940.
v. WILLIAM B SMITH, b. Abt. 1927, OH; d. Aft. 1940.
vi. ROBERT P SMITH, b. Abt. 1930, OH; d. Aft. 1940.
vii. GEORGE C SMITH, b. Abt. 1935, OH; d. Aft. 1940. 17. BLAKNEY BROWN6 SMITH (EDWIN W5, ADELAIDE A4 WALLACE, NAHUM3, NAHUM2, JAMES1 WALLIS) was born 07 Mar 1899 in Winchendon MA, and died 09 May 1937 in Akron OH. He married ELIZABETH M ?. She was born Abt. 1899 in OH, and died Aft. 1930.
i. ERNEST7 SMITH, b. Abt. 1920, OH; d. Aft. 1930.
ii. LAWRENCE SMITH, b. Abt. 1923, OH; d. Aft. 1930.
iii. MARVALIS SMITH, b. Abt. 1928, OH; d. Aft. 1930. 18. BERNARD CLARK6 SMITH (EDWIN W5, ADELAIDE A4 WALLACE, NAHUM3, NAHUM2, JAMES1 WALLIS) was born 15 Jul 1901 in Winchendon MA, and died Aft. 1940. He married KATHERINE M ?. She was born Abt. 1902 in NH, and died Aft. 1940.
i. KATHERINE I7 SMITH, b. Abt. 1925, NH; d. Aft. 1940.
ii. CONSTANCE SMITH, b. Abt. 1933, MA; d. Aft. 1940.
iii. BERNARD SMITH, b. Abt. 1935, MA; d. Aft. 1940.
iv. NANCY A SMITH, b. Abt. 1938, MA; d. Aft. 1940.